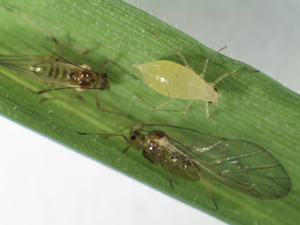 Fast Forward to June 2014: We know more about this aphid species—and its damage to the preferred host plant of wheat—thanks to research by Thomas Davis, Ying Wu, and Sanford Eigenbrode. Davis provides a synopsis for their Environmental Entomology article below. The cereal aphid Metopolophium festucae subsp. cerealium (Stroyan) is a recent addition to North America, but little is known about the species in its exotic habitat. We have been monitoring aphid populations for three years (2011-2013), and continue to do so, in an effort to determine whether populations are expanding in the REACCH region. Aphid prevalence in the region increased from 2011-2012 but remained stable from 2012-2013. We have assessed key aspects of aphid ecology, including aphid host plant preference and reproductive rates, on eight grass species including four native grasses (bluebunch wheatgrass, blue wild rye, Idaho fescue, and rough fescue) and four cereal crops (corn, wheat, barley, and oat). Aphids prefer wheat and avoid corn, but aphids also colonize barley, oat, and native grasses. Aphid reproduction is high on wheat and barley, intermediate on oat and blue wild rye, poor on Idaho fescue, rough fescue, and bluebunch wheatgrass, and aphids cannot survive on corn. 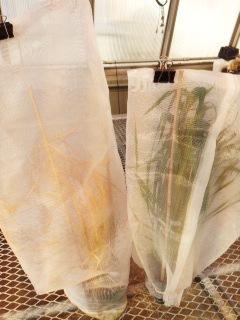 We have also determined that aphid feeding has substantial impacts on plant growth: wheat, rough fescue, and bluebunch wheatgrass are highly susceptible to aphid feeding damage in both shoot growth and root growth; although barley, corn, oats, Idaho fescue and blue wild rye were not damaged by aphids. 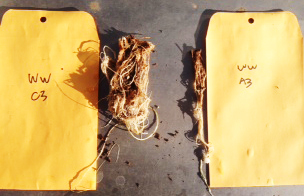 In the photos above, you can see aphid damage to wheat as it affects both above ground plant matter and below-ground roots. Our work suggests that wheat and barley are preferred by M. festucae cerealium, and that aphids reproduce most rapidly on these hosts and cause significant reductions in wheat but not barley growth. Also, M. festucae cerealium appears capable of surviving on native grasses, though only bluebunch wheatgrass and rough fescue are likely to be threatened by this species.